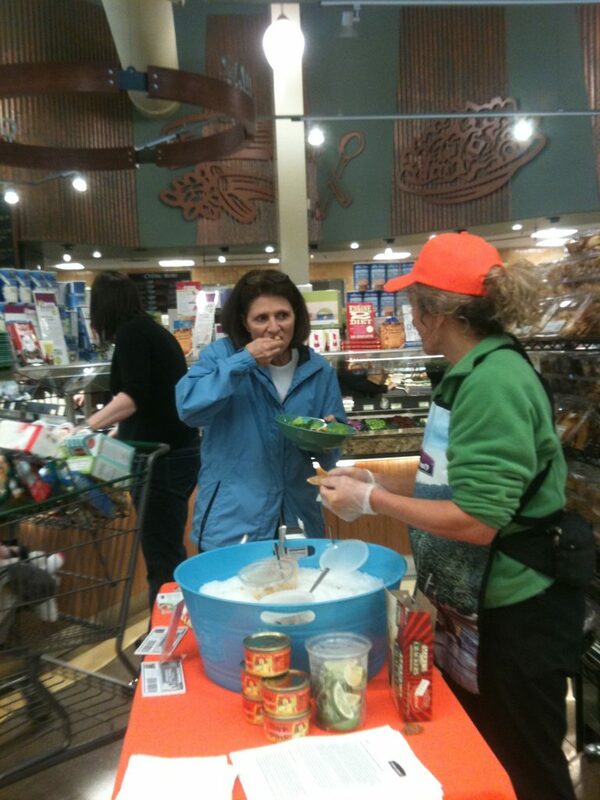 “How do you eat canned salmon?” is a common query from folks we meet at our food demonstrations. 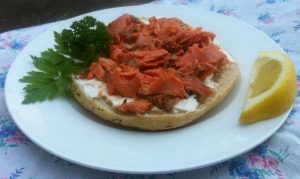 Canned Alaska salmon, especially in its traditional form, can be somewhat of a mystery food to the uninitiated. Complete with skin and bone, ‘traditional pack’ canned salmon I like to think of as the food symbol of the great, raw, wild, supremely healthy country that it came from Alaska. People who have eaten canned salmon since childhood are comfortable with the presence of the highly nutritious skin and bone, sometimes claiming to having fought with their siblings over who got those delicious crunchy little vertebrae. Other of us, often, ironically, from the salmon rich west coast, are puzzled, if not repelled by the presence of those highly nutritious anatomical parts that we mostly do not see in today’s highly processed foods. I look at a deboned chicken breast or pork and there is little there to remind us of the living, breathing creature that once is now that hunk of defenseless flesh. Not so with canned Alaska salmon that skin and bone is a badge of the life that was lived by that beautiful creature that felt the drive to leave its natal stream, traveling the Pacific Ocean for thousands of miles, and then return to its exact place of birth. I have said this many times, and it is true, when mixed into recipes those skin and bone seemingly dissolve into the recipe. We have served various canned salmon recipes to thousands of people, and not once has the person detected the skin and bone, though we quickly tell them. Traditional pack salmon has nearly double the long chain omega 3 fatty acids as skinless and boneless canned salmon fillets (which are delicious, too) and also provides calcium due to the presence of the bone. Straight Out of the Can! Just open the can, maybe squeeze on some lemon, and fork on! There is simply not an easier, better protein source than canned Alaska salmon. Finely chop celery, add salmon, whether Redhead (sockeye) or Thinkpink (pink) salmon, squeeze on lemon and put on a dollop of cocktail sauce. Eat canned salmon at lunch, or better yet breakfast, like the Japanese or Scandinavians, and see if the hunger pains don’t stay away for hours. There something unique about protein from coldwater fatty fish that satiates like none other. Delish, low calorie and energy sustaining! Do you know you called alaska a country? The use of country in this instance is referring to just a land mass as opposed to a country like the United States is a country; thanks for looking out though. How long can and open can of salmon stay in the refrigerator… And i can defintely you say eat it from the can…can i also use the blue can to make salmon cakes? I usually try to eat it within a couple of days, but mostly because of taste not safety. You can use any cans to make salmon cakes! Appreciate this because tonight opened my first can of red sockeye salmon and admit it – I was grossed out! Using it for salmon cakes and glad to read here that mixed into a recipe it’s undetectable. Made my first round of salmon patties tonight, thought it had bones because I bought a brand other than Starkist! I called my mom to complain about the bones and she said I’ve been eating them for years, lol. That was after I had grabbed a second bowl and meticulously picked out all of the vertebrae. Lesson learned, but still gross. I know the bones are weird at first, but they really are unnoticeable in salmon patties and salads. Just had a salmon sandwich using my first can of salmon. I scraped away the skin, wondering if it was OK to eat. Also drained the liquid before researching on computer. Guess everything in the can is OK to eat + being good for you. If you say it’s OK I will look forward to buying more canned. We encourage eating both the skin and bones! They are pressure cooked so they are unnoticeable when mashed up and full of nutrition. I like to cook sockeye fillets in my crockpot. Is it good to eat the fluids, skin, and the white stuff (–what is that white stuff?)? There are lots of nutrients in the skin as well as the bones. Are you talking about our canned fillet product or a raw product? As far as the white stuff it is most definitely healthy fats that come to the surface; very good for you! I was wondering, how long is the shef life of an unopened can. The ‘best by’ date id five years after processing, but ‘best by’ is a term declaring optimal quality, not shelf life. In the old days, I am told, the canners used to turn the cans upside down every six months to keep the oils migrating through the meat. I have never eaten Salmon, although I have tried many times. It is entirely too “fishy” for me. My Mother said I got my “weird” tastes from my dad. Maybe, because he and I didn’t eat any seafood or fresh water fish, and avoided a few other things. However, my family swears I make the best Salmon cakes/patties in the country (shhh, no cracks about how they must not get around much). Anyway, I remember the bones from when my mom would make the cakes/patties, and how they would just go away to nothing as she mixed up the patties. I saw her make the patties so many times, I knew the first time I made them how to make “hers”. 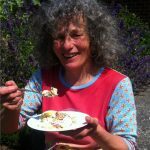 She’s gone, but reading articles like this whisks me right back to the kitchen, and I can see me watching her. I have nothing to add really, just a little thanks for that trip down memory lane. What a nice comment, and for my trip down memory lane as a result of your memories shared. Salmon cakes are a comfort food for many. I want to taste these best salmon patties in the country. Are you willing to share your secret? I’d love the recipe, too. I would love your recipe for salmon cakes please. First time I had it.. mixed it up with a bit of green onion chunks and pickles, with a dab of mayo…mixed it all up on the plate.. Delicious! Great..it is a GREAT food, on all counts. Canned salmon is fully cooked. You can eat it straight out of the can, or make it into recipes. Is the answer you were seeking? YES, I ASKED IF I CAN EAT CHICKEN OF THE SEA CANNED SALMON RIGHT OUT OF THE CAN? Have you SEEN Forrest Gump?? It’s shrimp, not salmon, that he’s talking about. Thanks a million for this post. I bought a can of Portside canned salmon from Sav a Lot. I wanted to mix it with mayo and make a sandwich. Nowhere on the can did is say “cooked”. It looked cooked, but I haven’t worked in the grocery industry for 40 years so I could not be sure. I saw it was salted, so that made me feel I could risk eating it if it was raw. Not sure, I scrapped off the skin, chopped it up and put it in a pan for 10 minutes. Then I mixed it with the mayo and made a sandwich. There is easily enough for a second sandwich, so I will look forward to that, now I know there are no food safety risks. My only minor niggle is that I wish the first sentence of this post was, “Canned salmon is pre-cooked.” It was only in the comments that I saw this was the case. Thanks for the helpful explanation, and the great advice about eating the skin. I saw bones but they would break up into tiny bits, I assume because of the salt. I did not notice any bones when I ate the sandwich. The recipe on the side of the can was for fried patties, so no hint on the pre-cooked nature of the salmon. That is why I thought it might be raw. The sandwich was great, and much milder than a tuna fish sandwich. I added pepper, maybe too much since the taste of salmon did not come through as strong as I expected. I assume Portside is a competitor, but they owe you a loyal customer next time you see them at the Canned Salmon Conference and Exposition, if there is such a thing. That is a funny thought, ‘Canned Salmon Conference and Exposition.’ There are plenty of seafood expositions, but none dedicated to canned salmon. It is pretty impressive, however, the warehouses in Seattle that store all the Alaska canned salmon. They are vast, three stories high buildings. Yes, canned salmon is very cooked, pressure cooked, under the very watchful eye of FDA inspectors. Portside is a competitor, but canned salmon people are pretty civilized bunch, due, possibly to all calming nutritional benefits of this great food, so it is a friendly competition. Thanks for your nice commentary. Growing up in the 60’s, it was a great night when my mother made salmon cakes for dinner. I can remember picking out the bones to eat first and felt cheated if my sister got more bones than I did, lol. As others have noted, you can’t tell the bones and skin are in the salmon as they are extremely soft. Also, unlike fresh salmon filets, the canned salmon is very moist and flavorful due to pressure cooking which seals in juices and oils. The only concerns I have with salmon of any kind are the mercury levels and toxin content, whether it be canned or fresh. Love salmon. Canned salmon. Salmon steaks. Any kind of salmon. My favorite that I’ve been eating for 40 years: salmon n’ eggs. Mix a can of salmon with two or three fresh eggs and scramble it in a pan. Put it on white bread for a sandwich or eat it by the spoon and take a bite of the bread. My kindergarten teacher told my mom that I wouldn’t eat apple sauce or baby food, or any of that. I kept asking for salmon and eggs. LOL. I like the little bones and the skin in the can. They are soft and delicious and healthy! Give salmon and eggs a try. It’s delicious! Let me add that I think salmon and eggs is a southern dish. When I eat salmon in the morning, I can almost feel my body saying. “Yes, this is what i really want to eat for breakfast.” It is exquisite protein with a good dose of preventative long chain omega 3 fatty acids to steady one’s mood through the day. thanks for your great commentary. 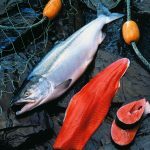 Do you know if StarKist wild Alaskan salmon is flash frozen at sea then defrosted before canning and cooking, as is done with tuna, etc? I eat a lot of salmon. I love your article. I cannot attest precisely to Starkist’s skinless and boneless salmon production methods, but you are right to wonder. I prefer that wild Alaska salmon is caught and canned in the USA because I think it is a tastier product and I like the idea of supporting U.S. workers. Thanks for your questions and comments. Where is the best place to buy canned red salmon in bulk. I love canned salmon, love the little bones and I love salmon fresh, too. Hi there, When you say ‘canned salmon in bulk,’ what do you mean by ‘bulk?’ Define your terms, and I’ll give you an answer. thank you! I split the difference. I dig out the skin and bones, chop ’em up fine on a cutting board, then return ’em back to the salmon meat, give the mixture a stir, and continue on with my recipe. I am not sure how much sodium will be gone, but if you purchase my no salt added ThinkPink salmon it will be very low..with just 64 mg (3% DVR) in a 1/4 cup serving. Just ate wild caught, pink, canned salmon and some added olive oil and croutons…yum! Do you know why it would have written on the can ‘California Prop 65: This product may contain a chemcial known to the State of CA to cause birth defects or other reproductive harm.’ I’m past reproducing, but just wondering if this refers to mercury? Thanks! I love canned pink salmon and olive oil. What a delicious combination. As for the California prop 65, I cannot speak to the particulars of that law, but I am surprised to hear such a statement would appear on can of Alaska pink salmon. Alaska salmon have been tested annually for mercury and have been consistently found to have negligible or no mercury. I refer you to the following document; https://www.alaskaseafood.org/health-nutrition/wild-pure/. So for spine pieces, I can eat those? Or break them up? You can do either. Customers have reported having fought with their siblings over those crunchy little bones. They mush right up too…thanks! I’ve eaten tinned salmon for the past 70 years and I LOVE the skin and bones. The family laugh at me because I open the can, remove the skin & bones into a tiny dish and eat them all to myself ! Got to be excellent for health. I LOVE THE SKIN AND THE BONES ! FAMILY THINK I’M CRAZY BUT I’VE ALWAYS EATEN THEM SINCE I FIRST HAD TINNED SALMON 70 YEARS AGO. Where Is canned salmon with bones and skin available for purchase? When I’m traveling for work I find the nearest grocery store or Walgreens and buy a can of bumble bee premium wild pink salmon. I eat it right out of the can. All 7 servings! I don’t know if that’s overdoing it, but I do like the stuff. The one thing I just noticed is that the cans just recently stopped saying “Alaska” on the tops. Hopefully same product though inside. Never been to Alaska but I hope to go one day and witness for myself the great migration up the streams to the small cold waters where spawning takes place. I also don’t mind the skin and bones, having grown up eating it right out of the can. If there wasn’t enough to go around my family of 7, Mom would make salmon loaf. Oh how wonderful a treat that was!! My sister,after out on her own, also shared a recipe for savory muffins served with a drizzle of melted butter! Yum! While my kids were growing up, we were pretty short on cash. I often made a meal of canned salmon, milk, chopped onion, celery (if I had) and created a chowder. Sometimes with a diced potato in it or even carrots. Whatever was in the pantry!! Lol One thing that puzzles me: right before my thyroid surgery, I believe I was low in certain nutrients. Surprisingly to me, while not many foods appealed, I felt drawn to open a can of salmon. It set well in my stomach and tasted better than anything else at that time. Interesting, ‘ay? What a lovely post. You paint quite picture with your words. Eating nourishing foods, such as canned wild salmon, does not require a king’s ransom. Your mother, and it sounds like yourself, are/were smart people. And yes, the digestibility of canned salmon is something I really appreciate at times. I did not understand why ‘digestibility’ would be a nice feature of my favorite food, but as I age I have come to understand some things, actually many things, I did not before in my callow youth. I am actually making a pink salmon salad for my ‘work day’ today. Tastes great on a toasted bagel. Thanks! Thanks for this article. I love wild caught Alaskan canned red (sockeye) salmon. I wish I could find the real thing with no or less sodium. Also, I wonder if you can help me decipher how to know the fish in a can is wild or wild caught. I hardly ever find canned salmon paper labels that read “wild caught packed fresh in Alaska” with the canned stamped “Wild Alaska Salmon USA”. Usually it is only labeled “wild”, which I understand is not wild caught but usually sustainably farmed from wild salmon (DNA) spawned from wild ocean swimmers. It can be confusing with all the legalities of labels and can stamps. Please help. What brands do you know are actual wild caught Alaskan canned? I am not sure why they have stopped putting the “Alaska” embossed on the can like they used to. It may be that that little addition to the can costs was not deemed worth it. And yes, the Alaska salmon caught can be misleading because maybe the salmon was caught in Alaska, frozen and then shipped to a foreign land for processing. I am here to testify, however, that the Alaska fish processing capacity is in full tilt and most Alaska salmon is caught, and processed in Alaska. Look on the label for a line that says ” Product of the USA. to eat no more than 12 ounces of canned salmon per week. I have been eating about 4 cans a week plus a couple cans of tuna. The coworker said that is too much mercury. 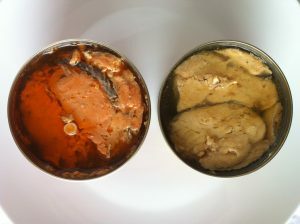 What are your thoughts about daily or almost daily canned salmon consumption? Sorry about not responding to your question sooner. I cannot speak for the tuna, but I can provide you with the following. It was buried deep in my blog. I think I will recycle the post because it deserves another go-around. THERE HAS NEVER BEEN A HEALTH ADVISORY FOR ALASKA SALMON- EXCEPT EAT MORE OF IT! Thank you SO much! All of you! At times I’m blessed with red and pink salmon from the food pantry. But the cans have been decorating the pantry shelf because I couldn’t figure how to deal with all the bones until landing here… I’ve just finished a delicious dinner of canned redeye drizzled in olive oil and lemon juice on top of salt-free saltines. Now I’m going to turn the remaining 7 cans over, although I think their days of shelf sitting are numbered! Thank you. I come to same conclusion every time..canned wild Alaska salmon is a great protein source. Just mash those bones up..they truly are undetectable. My grandpa used to eat it from the can after first letting Italian dressing soak into it. I’ve always loved salmon patties and am now eating it as is from the can. I really have nothing to add to what has previously been posted other than I have really enjoyed reading all the posts. I am a regular cyclist even in winter. I experience dry eye from cycling. I read that Omega 3 cures dry eye. I began eating 2 ounces of canned salmon a day and the dry eye stopped almost immediately. It was amazing. That is quite a testimony. What type of salmon do you eat? Pink or sockeye? I don’t think it makes much of a difference nutritionally, myself, and I prefer ThinkPink over Redhead. I eat this three or four times a week..a can of ThinkPink, a whole lot of finely chopped celery and onion, maybe some chopped jalapenos from a jar, maybe pickle, some lemon grated lemon rind, if I have it, a little mayo, maybe tiny bit of Dijon mustard–Delicious! I eat this in two days, generally.